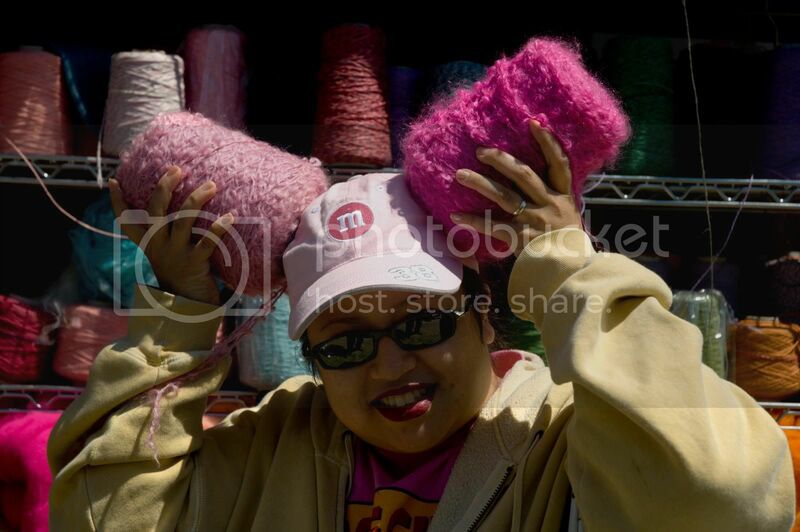 It was a wild and wooly (Hee!) 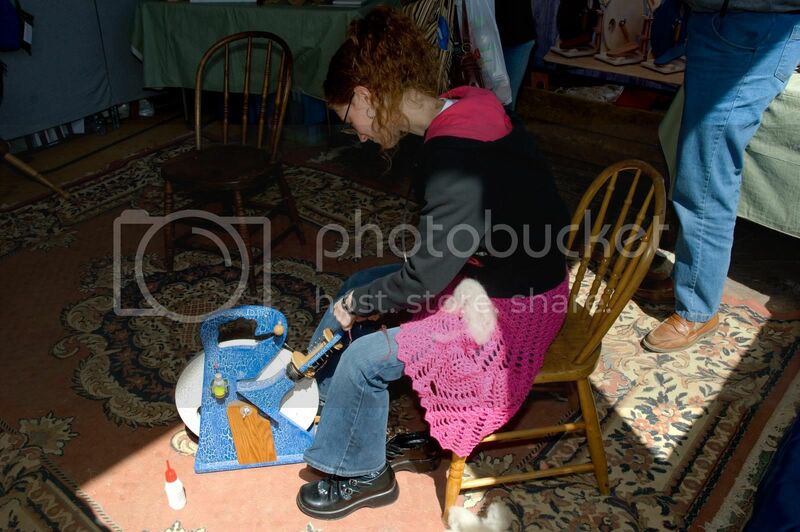 weekend here, thanks to Turtlegirl‘s arrival on Thursday afternoon and Artsygal‘s on Friday night for the Maryland Sheep and Wool Festival. We got up BRIGHT and early Saturday morning (like 6am early) and hit the road at about 7. We arrived at the fairgrounds just about 8:00 and headed straight for The Fold. We weren’t the first in line for the STR. We were 4th, 5th, and 6th. Ahead of us were two MORE folk that we knew from the boards – Ajastoy and LICraftgal – along with a woman who had come clear from Houston for the fest. We had a blast gabbing and giggling with everyone in line until they opened the booth at 9am and the frenzy began. 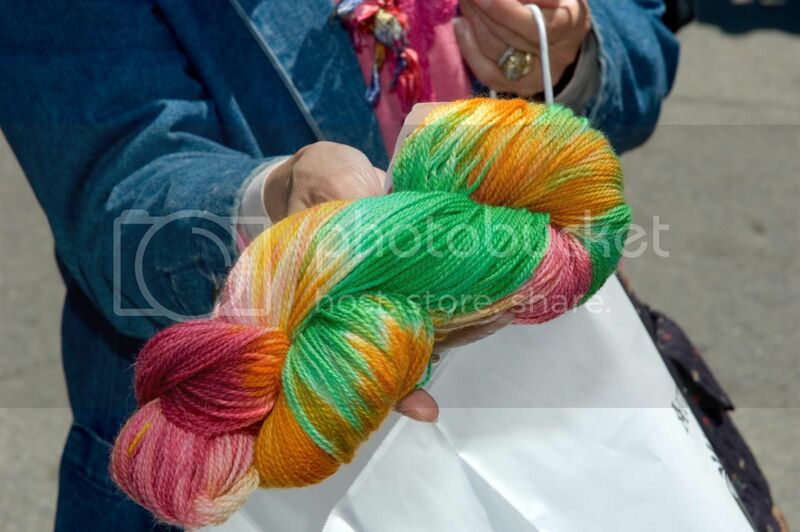 It gets a bit blurry for a while there, although I do remember the woman behind me who had at LEAST 20 skeins in her arms as she came up to the register. 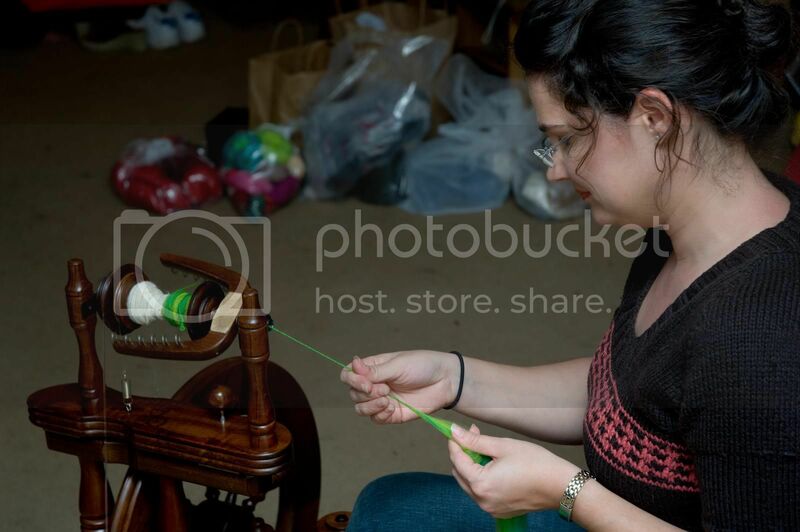 We got home and played with our new fiber, Cristi and I on our wheels, and Jas on her brand-new Golding dropspindle. Clearly, Jas and I were better at avoiding the camera. 😀 The whole album is here. PS. Penny_Karma – Lady Eleanor is from Scarf Style. Or maybe Wrap Style. Dangit, I never remember. But I think it’s Scarf. 20 comments to SHEEP AND WOOOOOOOOL!!! Yes, you should fear me! MWAHAHAHHAH! Just kidding! You guys sound really cute-I was just trying my hand at sound editing-so far-not so good-I can’t import it right and we sound like chipmunks! Thanks for the mention! Wow.. you summed that up quite well! 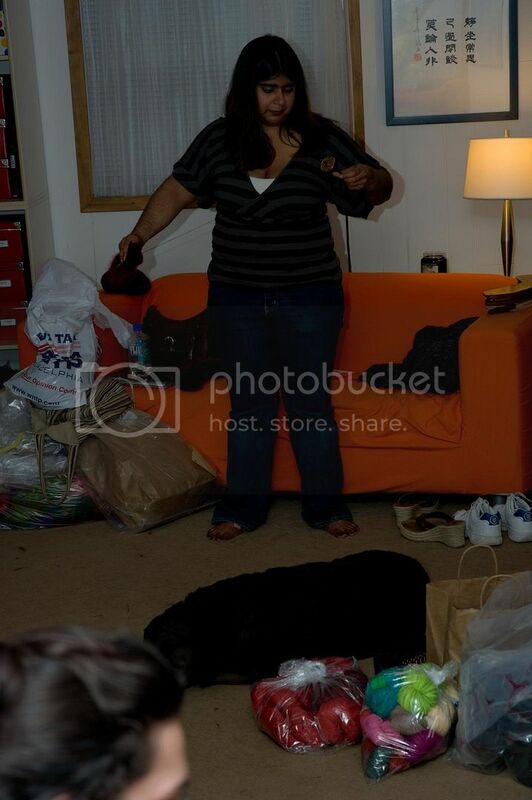 And managed to sneak in a pic of me that I didn’t even know Kris took! Fun fun fun! I’m so glad I came with you two! What a great day! It was so much fun hanging with you. I WILL be at SAFF. Come hell or high water. Oh Kemtee that better be a promise and not a threat. There WILL be much fun to be had. you need to be inducted into the Oatmeal Cookie Club. Ha ha! Looks like a good time! 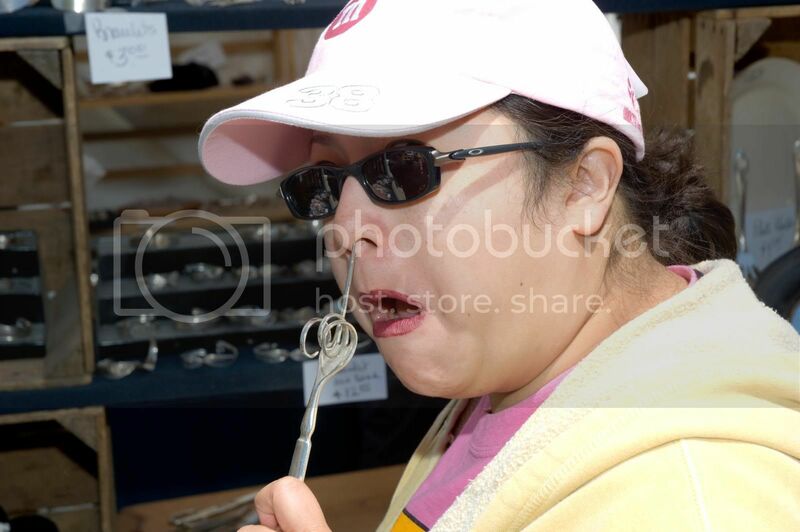 Is that an orfice hook (that used to be a fork) that Anne Marie is sticking up her nose???? 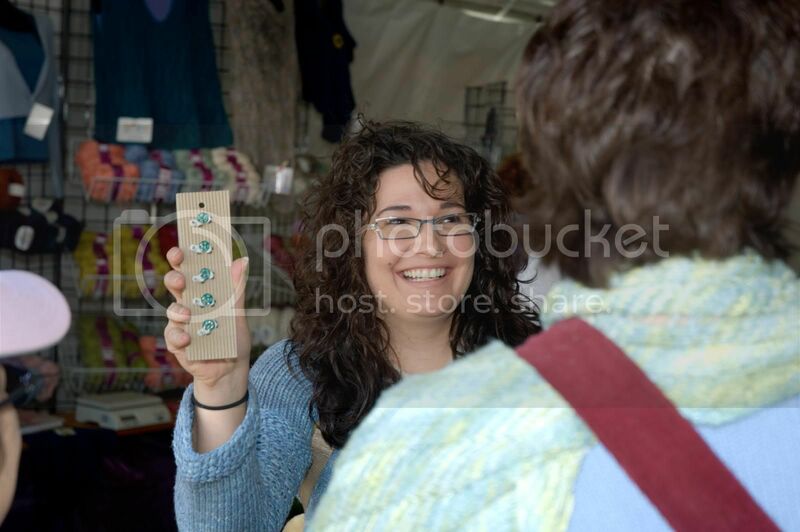 I hope she abided by the “You put it in an orfice/you buy it” policy! Me, adorable? I told my DH you said that and he snorted and said, “Yeah – you’re adorable like the goddess Pele – draw them close so you can go in for the kill!” BTW – he totally got your Knitty name – no explanation necessary. And you will see me again – at the PKF (I sure hope that acronym is in the right order!). I was at SAFF last year and thought I was the only blogger in the place. We’ll have to all meet up this year. Did I hear Oatmeal Cookie? S’okay I’m pretty much like Calvin. Nice summary! Sounds like you guys yad a blast… I’m definitley hooking up with you all next year! It looks like y’all had a wonderful time! I am happy for you! We weren’t following you, LOL. I seriously think I was drawn to the Tomato sweaters. Must. Have. Tomato. Sweater. Again – totally awesome meeting you guys!! Sounds like a lot of fun. One of these I’ll make it to MDSW. It was great to meet you guys last weekend – loved those Tomatoes! You guys looked like you had so much fun! I’m totally living vicariously through you all too. It looks like you had a fabulous time.